Expressionist forms of painting have found new ways of evolving in recent years, especially in American art. It seems that artists are pervasively seeking to give painting another form of openness, which exists without self-imposed constraints. Having said this, I find in the works of Steven Seinberg a "delicate balance" whereby his lucid, yet tenuous forms become what they are through the artist's keen self-reflective ability to visualize his painterly process each step of the way. His paintings do not require a theory. Instead they offer sensitive viewers an invitation to engage in the act of seeing on the level of visual tactility; the actual encounter with his gestural forms unlocks new meaning, which resonates beyond our expectations. Seinberg's paintings ride on the edge of something unforeseen, a painterly ethos that gives the texture of his surfaces a sense of accuracy, another openness on the reality of what makes a painting become a painting. To accomplish this with alacrity and confidence is in itself meaningful. Seinberg's paintings radiate a transcendence and grandeur on a scale that few painters are capable of achieving today. They re-open the fundamentals, and in doing so, offer a new chapter in the history of connoisseurship. To see a Seinberg painting with clarity, is to know where it exists in time and how it sustains an eloquence of its own. Seinberg's paintings involve a complex process in addition and subtraction, as he ardently focuses on the preliminary aspects of releasing form from rigid confines. What may appear as an instantaneous splash of ochre pigment is more complex and in some ways innately inconspicuous. The challenge, of course, is to obtain poetic insight through various methods of manipulating the materiality of pigment, thus giving the surface a clear and convincing visual affect removed from the obvious. I refer to a painting titled, Lagoon (2018), in which Seinberg combines oil paint with graphite and various mixed media as he does consistently in his work. Of course, the affect is intended to look as if it happened in a glance; but then there is the challenge to go deeper, to penetrate into the actual structure of how the oppositional dark and light elements are applied and/or removed, and how they appear to combine with one another at the same moment on a single surface. The result is, in fact, a poetic one. Indeed, Seinberg's paintings may function as a form of "visual poetry"— to cite the expression given to the artist's work by Seinberg's gallerist. While we may argue over the meaning of the term, language-in-itself will not help us clarify the artist's experience. Rather we are obliged to decode the artist's vision from another perspective, such as seeking out Seinberg's lyrical fascination with what he sees and how he transports that vision onto canvas. In this way, others may (or may not) take part in the artist's emotional involvement. It is finally up to the viewer, as it always is, when one encounters a new painting for the first time. How do we discover the emotional content of an artist's work unknown to us in the past? And how do we envision the visual antecedents in a painting, which, after all, are limited in how they historically possess the surface? These are important questions, particularly as art comes to the screen where our tactile response to painting is in competition with other more seductive images representing politics and advertisements in a way that art does not. As an alternative, I prefer the notion of visual poetry in the manner that it transforms our vision of painting. As the San Francisco poet Michael McClure once exclaimed some years ago, we need poetry that gives us "relief from the revolution," despite what the revolution was or has become in recent years. The point is this: Steven Seinberg's paintings impress me as having the potential to enact a way of seeing through color and form – to offer an alternative way of coming to terms with an optical tactility, where the retina reaches out and makes contact with our emotions in a way that instigates a refinement of desire. This is a phenomenon that belongs to painting in that it denotes when a painting becomes significant. The act of seeing a painting in the most complete sense should allow for a sheer haptic experience. Only the Light on the Sea, is the title of this exhibition. What could be more poetic? It is not simply the title, but the content embraced through it. I sense this line as having a special resonance that goes beyond obvious surface maneuvers into the language of paint; a language deeply inscribed by an acute consciousness of motion, a memory that travels the distance between chaos and sensuality. The configuration of this gestural motion in Seinberg's, Nothing That Comes From the Other World (2019), offers the viewer a redemption through the pulse, namely the feeling of the heartbeat taken beyond the grasp of particulars, yet known to be the cause of what brings us into the world, that is, a way of seeing the world as a myriad of poetic infusions without default. Having just seen the exhibition at New York's Metropolitan Museum of Art, Epic Abstraction, the poetry is sometimes present, yet at other times difficult to trace. The paintings are large. Several belong to the Abstract Expressionist painters seven or eight decades ago. The grand scale of these works is manifested everywhere. Whereas the curation, the concept, and the mounting of the exhibition is problematic, there were several works worthy of attention – some first-rate Rothko paintings, to be sure. I mention this only to suggest that within the logos of expressionism – whatever the context: cultural or historical – the poetic message is not always a priority. Other issues, both internal and external – appear to over-ride it. To explain the poetic content in a painting is a challenge. But here lies the crux of the matter as to why it requires justification as something necessary, if not vital, to visual art today. It is clear that Seinberg's paintings, whether in his signature work-on-paper format or his large canvases, both reach out implicitly toward poetry in a more direct way than much Abstract Expressionism. Within the process of "reaching out," one discovers the tension within his painterly language that gives poetic content to the work. I am thinking of, Below Her Closed Eyes (2019), where a densely concentrated area of blackness is askew to the right in the painting. How does this form reach out? And what does it mean? One might presuppose that the form as an eye is not, literal. Rather it may represent a feeling of embarkation toward sleep. The diagonal position appears necessary as does the purposefully rendered lack of a clearly defined space. The poetry in not simply about representation, but the sensory feeling expressed in the weariness that follows extreme wakefulness as the "closed eye" enters into sleep, which is the domain of the unconscious. Having recently read William Blake's, Songs of Innocence and Experience (1788 – 94), the play of oppositions between two sensorial states of mind often appears less obvious than one might expect. Initially, Blake goes for what is simple and direct, then transforms this worldly phenomenon into a paradoxical ambiguity that elicits a metaphysical state of mind beyond the everyday world. In a similar way, one might consider that Seinberg is less interested in painting oppositions than in the passages between them. What we see in the everyday world is not what the artist paints. Rather the atmosphere he paints moves us toward another hemisphere where we allow ourselves to embrace meaning through an emotional response to the lost intervals of time that intercede upon our expectations of what is real. As Blake continued to question what is real, Seinberg brings this quest into the present – less as a proposition than as a search for everyday transcendence. Because of Seinberg's desire to take his sensory responses outside of chaos, the paintings remain steady, which should not be confused with repetition. 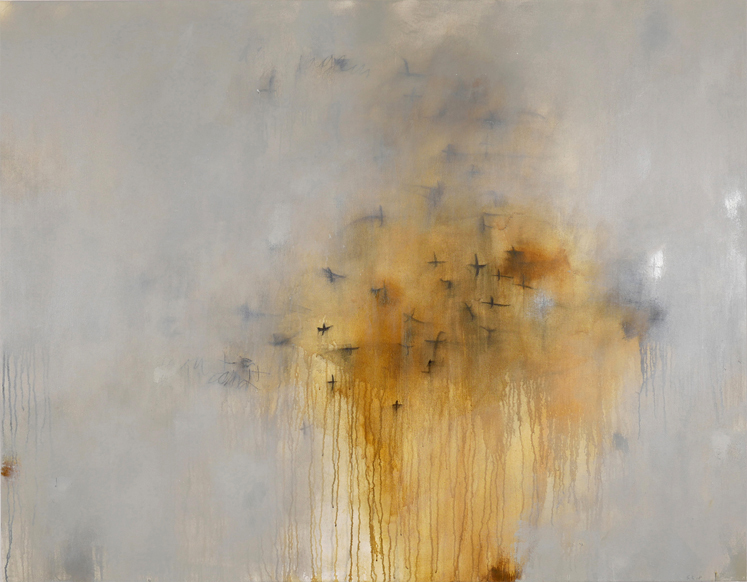 Rather his lyrical scope as a painter implies the need to evolve a vision through the agency of his materials. Certainly, color is part of this, as is form. But, in addition, there is the artist's ability to expand a painting, as in, Spreading to Water (2017), into a poetic context that is something more than an expression. Perhaps, we could call it a metaphysical extension of the real, an idea transformed into a harkening sensibility that removes itself from fashionable trends. The poetry in painting, which I understand as essential to the work of Seinberg, does not require a political message. Nor does it advance a retreat into "art for art's sake." Neither are relevant to Seinberg's work (although, undoubtedly, there are those will argue otherwise). To retrieve the poetry within the surface of Spreading to Water, is a matter of seeing and of coming to terms with one's position in physical, mental, and emotional terms. What gives this painting its sense of completeness is the discovery that poetry is held within the surface, possibly unknown to the painter himself, until the moment when it suddenly erupts, ready to transcend the mediated chaos of common ideas.